Early in my academic career I had started to find the climate of academic philosophy unwelcoming to women. No one in my department taught works by women philosophers; a mentor had openly doubted women’s ability to do philosophy. As one of the few women in the program, I was lonely. I believed women could make significant contributions to philosophy, but even so, I questioned whether philosophy was a place where they could thrive. This began to change the year I arrived in Iowa. 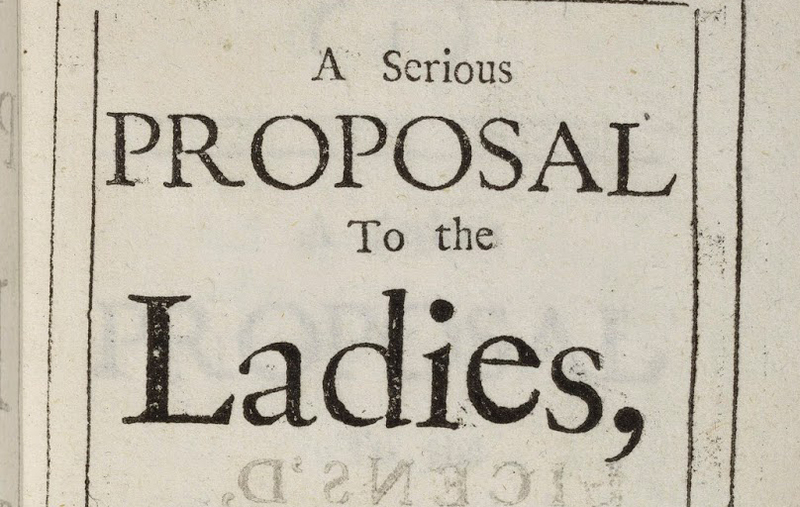 One afternoon I was reading an obscure monograph when a footnote led me to A Serious Proposal to the Ladies by Mary Astell, who lived from 1666 to 1731. I’d never read works by women philosophers who lived before the 20th century, assuming that since they didn’t show up in textbooks or in class discussions that they didn’t have anything unique or profound to say. Yet I was captivated by the title of Astell’s work. Here was a book personally addressed to women. Reading A Serious Proposal, I was surprised to find that Astell offered complex arguments about the nature of mind and body, tackling some of the same issues of metaphysics and epistemology as René Descartes and John Locke. Yet her core message was simple: educate women so they can pursue personal happiness and contribute to society. I was amazed by Astell’s boldness and unapologetic ambition, how she willed into existence a new, heartening vision for women’s lives. As I worked on my dissertation, I began to realize that part of the reason that philosophy lost Astell, and other brilliant women, has to do with how the history of philosophy is crafted and taught. The history of philosophy is not a comprehensive catalog of different theories, or a series of accidental events in human history. It’s an account of the development of the science of human reason as understood by a few 19th century historians, who focused on theories of knowledge. These histories of philosophy, written by men, relegated women’s concerns to the sidelines. I came to see the plight of women in philosophy in Astell’s story. And in my own. Those are the words of Regan Penaluna, who, in the rest of her essay, “Sexism Killed My Love for Philosophy Then Mary Astell Brought It Back,” tells her story. Read the whole thing. Comment not showing up? Check the Daily Nous Comments Policy.